What a great way to remember a wonderful day at the beach! 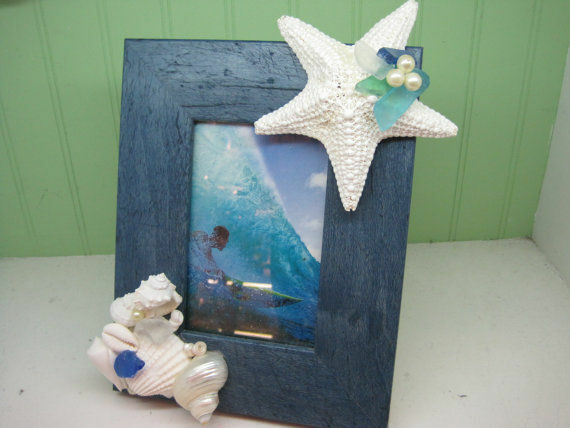 I took a pretty deep blue wood frame and added some pristine white seashells and starfish to accent the color of the frame. This piece has a wonderful natural feel to it. On one corner, I placed white conch shells, a white arc shell, a pearlized turbo and some seaglass. Then, on the opposite corner, I added a white jungle starfish and a cluster of seaglass and pearls to finish it off. It measures 9 1/2 X 7 1/2, with a picture opening of 3 1/2 X 5 1/2. Use this piece to brighten up any room and bring a little bit of a coastal look into your home!